Case study 1: Alfred and Charles D'Silva, two brothers from city's East Rajabajar area run an online based lifestyle store. As people order for their products online from all over the city, Alfred and Charles depend on their bicycles to deliver the products to their customer's doorsteps. Case study 2: Shams Ramadan, a student of Dhaka University (DU) commutes between the DU campus and his home in city's Azimpur area regularly. He cannot travel to the campus on bus since he lives quite close to the campus, while regular rickshaw rides on the way to university and back home would cost him a considerable share of his monthly pocket money. To resolve this problem, Shams has recently bought a bicycle. With his bicycle, Shams is now free to attend classes or hang out with friends almost anytime. Volunteer groups help students learn how to cycle on streets. The above two case studies show how the recent bicycles craze is influencing the life of the students. 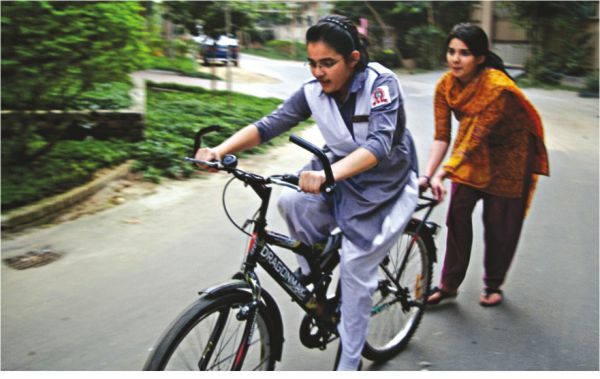 Since outrageous traffic congestions and ever-increasing transport fares have become the order of the day, riding bicycle is becoming increasingly popular among the students as a convenient and cost-effective mode of transport. Unlike other forms of private transports, bicycles do not cost one a fortune. Apart from its economic benefits, riding bicycle is good for one's health since it increases the rider's stamina, reduces stress and it involves zero carbon emission. In a nutshell, riding bicycle can save money, save health and it can save the planet earth as well! Bicycles are becoming popular as a cost-effective mode of transport. Given all the benefits, as more and more people are now willing to take up bicycling, there are some organisations to help beginners learn how to ride bicycle. One Degree Initiative Foundation (1di) and BDCyclists are two such organisations. Both of these organisations have their group pages on Facebook, where people can join and register for weekly sessions on bicycling. 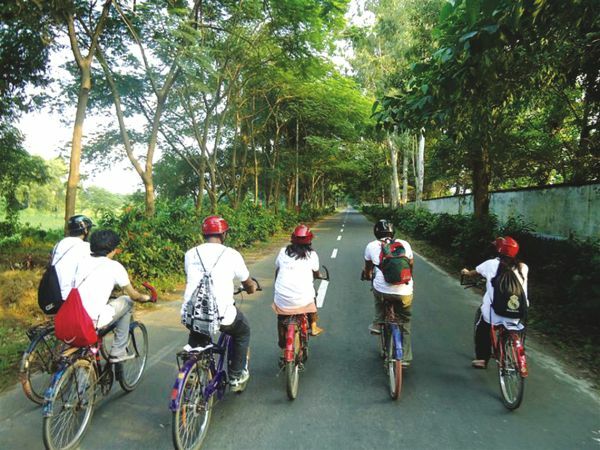 The BDCyclists runs bicycle training sessions on Abahani field, Dhanmondi every Saturday from 7 am to 10 am. Anyone can join these sessions by making a prior registration on the group's Facebook page. “The first thing a beginner rider needs to learn is to get comfortable with his or her bicycle. In BDCyclists, learners usually take five to six classes to fully learn bicycle riding. 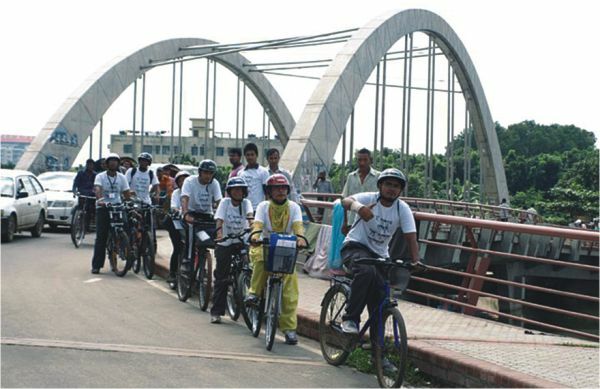 However, after learning the basics of bicycle riding, one needs to practise a lot before going for long rides.” says Tanzin Chowdhury, a member of BDCyclists. 1di also runs a special training campaign named 'Training on Wheels' for the beginner riders. To know the schedules of the training sessions provided by 1di, one can log on to www.facebook.com/ 1diTOW. Needless to say that to practise bicycling one needs to have a bicycle first. Regardless of being an expert rider or a beginner, the Bongshal Cycle Market at Bongshal, Old Dhaka, can be a haven for every bicyclists. Here, one could find every type of bicycles imaginable and all types of spare parts such as tyre, tubes, chains, gear etc. When asked, what are the things to consider before buying a bicycle? Mohammed Sadeq, Proprietor, Peerless Bicycle says, “One should make sure that the bicycle is proportionate to one's height, otherwise, there would be high risk of injuries while riding. The frame of the cycle can be light or heavy according to the rider's choice. ” Charles D'Silva, a student and expert bicyclist says, “People should be sure about their purpose before going for bicycle shopping. If someone is looking for speed, the person should go for road bikes with lighter frames, while for long rides or hiking, one needs to get mountain bikes which are heavier in weight but suitable for all terrains.” The price range of the bicycles can be anything from Tk 5000 to Tk 100, 000 depending on their quality and looks. However, a visit to the Bongshal Cycle Market suggests that students with their limited budget can manage a fairly decent bicycle from brands like Meghna, Peerless, Lux, and Trek with a budget of Tk 10,000 or more. Bicycles can effectively reduce traffic jams on streets. One should never ride on a bicycle without wearing a helmet. Wearing a protective helmet is the most effective way to prevent injuries while riding. Bicycle helmets are usually lighter than the helmets worn by the motorbike riders. A properly fit bicycle helmet provides a rider with better protection and ample ventilation. Bicycle helmets come in different shapes and sizes for commuting or mountaineering. Riders can find all types of bicycle helmets in Bongshal Cycle Market or in city's Baitual Mukarram market area. Depending on their quality and brands, prices of the bicycle helmets range between Tk 1,300 to Tk 3,000 and more. Riders can keep a rechargeable light with them to ride safely in dark. Gloves, elbow guards, knee guards can also come in handy during long rides. Levers like brakes and chains should be checked every time before going for a ride. 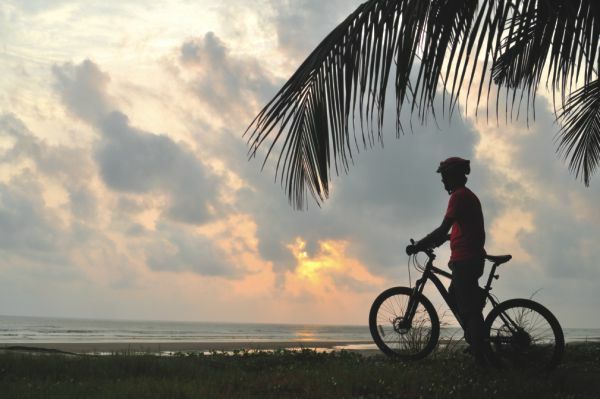 “One should never put on a headphone while riding a bicycle,” says Tanzin Chowdhury. “Riders should always abide by the traffic rules. 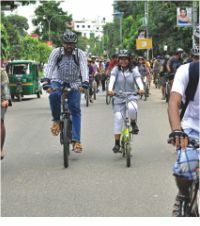 It is always safer for the bicyclists to ride on the left side of the road to prevent clash with other vehicles,” Tanzin opines. As the moving components of a bicycle come into close contact with mud, dust and debris during a ride, it is important to properly clean the different parts of a bicycle at a regular basis. Lubricating different parts of the bike with grease or oil is also necessary for smooth riding and to prevent rusting. With the regular task of attending classes to hanging out with friends every student leads a very active life. Plus, students also have to bear extra responsibilities from their families like shopping for daily groceries or paying the utility bills since superiors of the family are often very reluctant to perform these duties! Nevertheless, unbearable traffic jam on road and scarcity of public transports are making it difficult for students to carry out even their day to day activities on time. 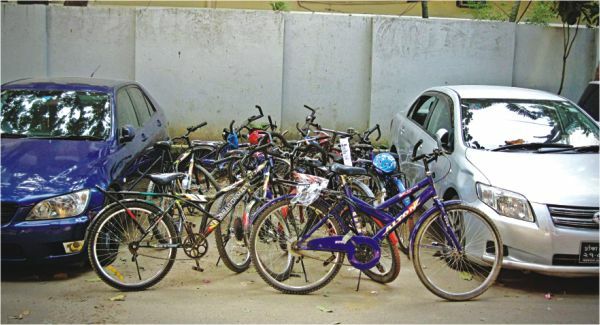 So, it will not be an overstatement to say that it is high time that every student gets a bicycle and battle out all their commuting blues with their two-wheelers.